This article first appeared on Waging Nonviolence. 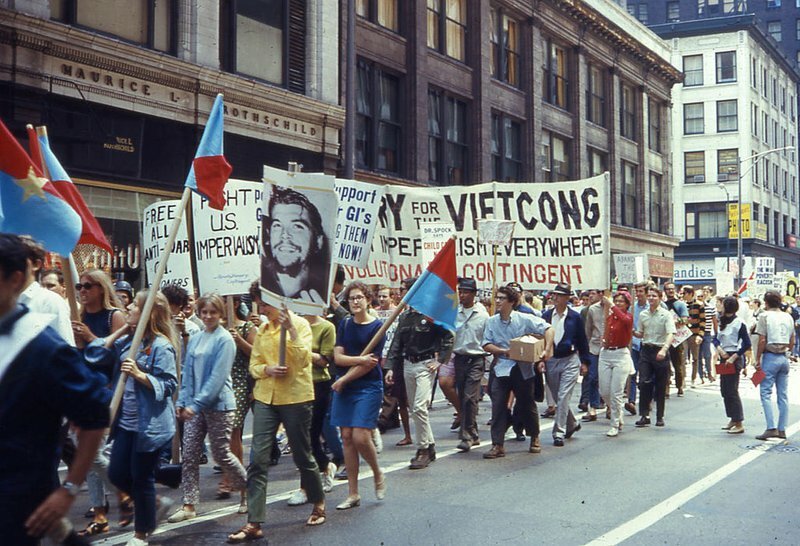 Anti-war march in Chicago, 1968. Credit: By David Wilson CC BY 2.0, via Wikimedia Commons. Ken Burns and Lynn Novick’s PBS series, “The Vietnam War,” deserves an Oscar for its depiction of the gore of war and the criminality of the warmakers. But it also deserves to be critiqued for its portrayal of the anti-war movement. Millions of us joined the struggle against the war. I worked for years as an organizer for major national demonstrations and many smaller ones. Any semblance between the peace movement I experienced and the one depicted by the Burns/Novick series is purely coincidental. Two of my fellow activists, Ron Young and Steve Ladd had similar reactions to the series. Historian Maurice Isserman says the film is “both anti-war and anti-antiwar movement.” Another historian Jerry Lembcke says the filmmakers use the technique of “false balancing” to perpetuate myths about the anti-war movement. These criticisms are valid. But for today’s resisters, the PBS series misses the most relevant story of the Vietnam era: how the anti-war movement played a critical role in limiting and ultimately helping to end the war. Instead of celebrating the war’s resistance, Burns, Novick and series writer Geoffrey C. Ward consistently minimize, caricature and distort what was by far the largest nonviolent movement in American history. Anti-war vets are the only participants of the peace movement that Burns and Novick relate to with any sympathy or depth. John Musgrave, a former Marine who joined the Vietnam Veterans Against the War, describes his transformation. We also hear anti-war vet John Kerry’s moving testimony before Congress: “How do you ask a man to be the last man to die for a mistake?” And we see and hear from war veterans who threw back their medals at the Capitol steps. The filmmakers would have done well, however, to describe the extent of that GI resistance movement, such as the 300-plus underground newspapers and dozens of GI coffeehouses. It’s disconcerting that the filmmakers did not interview even one draft resister. Had they done so, we could hear why tens of thousands of young men risked up to five years in prison rather than fight in Vietnam. The filmmakers would not have had difficulty finding any as there were at least 200,000 draft resisters. Another 480,000 applied for conscientious objector status during the war. In fact, more men were granted CO status in 1971 than were drafted that year. Likewise, the film shows footage from both the Moratorium on October 15, 1969 (demonstrations that drew more than two million people in hundreds of towns and campuses) and the Mobilization in Washington the next month, which drew more than a half-million marchers (the largest single demonstration in American history until the Women’s March earlier this year). Unfortunately, Burns and Novick do not tell us about the impact of the peace movement’s fall offensive: It forced Nixon to abandon his plans for bombing the dykes of North Vietnam and/or using tactical nuclear weapons. This story was not known at the time, but numerous historians have written about it based on interviews with Nixon administration officials, documents from the period and White House tapes. Another missed opportunity: We see scenes of the massive demonstrations throughout the country—and on college campuses—in reaction to the Cambodian invasion and the killings at Kent State and Jackson State. That eruption forced Nixon to withdraw from Cambodia prematurely, another point Burns and Novick failed to tell. Meanwhile, the scenes related to Daniel Ellsberg’s release of the Pentagon Papers in 1971 do not make clear that Nixon’s reaction led directly to Watergate and his resignation. Had Burns and Novick also interviewed Ellsberg, who is alive and well in California, they would have discovered that the most significant individual act of civil disobedience during the war was inspired by the example set by draft resisters. Finally, the film does not explain that Congress cut off funds to the war largely because of the intensive lobbying efforts by such groups as the American Friends Service Committee and Indochina Peace Campaign, or IPC, led by Tom Hayden and Jane Fonda. Don’t take my word for it. In his testimony before Congress the year after the fall of Saigon, the last U.S. ambassador to South Vietnam blamed the peace movement’s lobbying efforts for eliminating the funds needed to forestall the final North Vietnamese offensive. Not mentioning IPC’s lobbying efforts is particularly puzzling since the only peace movement activist interviewed for the series was Bill Zimmerman, one of IPC’s principal organizers. We hear opinions from Zimmerman about a variety of other issues, but absolutely nothing about the organization he describes in detail in his memoir. All these omissions and distortions notwithstanding, we must credit this 18-hour epic as one of the most powerful anti-war films of all time. “The Vietnam War” certainly rivals “All Quiet on the Western Front.” Just as that World War I classic portrays the nightmare of trench warfare, Burns and Novick show horrific scene after horrific scene of mutilated bodies and corpses. Through the words of combatants on both sides, you can almost feel what it’s like having bullets and shrapnel flying at you and watching your buddies get hit while you’re trying to kill other human beings. Burns and Novick do more than immerse you in blood. They demonstrate the callousness, ignorance and hubris of the warmakers. You can hear tapes of John F. Kennedy, Lyndon Johnson and Robert McNamara revealing that they knew from the outset that the war was unwinnable and that more combat troops and bombings would not change the outcome. Yet they lied to the public and sent hundreds upon thousands of Americans into the fray, while dropping more tons of bombs on Vietnam, Laos and Cambodia than the total tonnage of bombs exploded by all combatants in World War II. You can also hear Richard Nixon and Henry Kissinger cynically plotting to prolong the war for four more years so that he could run in 1972 without the stain of losing Vietnam to the communists. Generals and battlefield commanders in Vietnam show just as little regard for the lives and limbs of their men as their bosses in Washington. Soldiers fight valiantly to capture hills, where dozens are killed or maimed only to have their leaders tell them to abandon their conquests. We also see how North Vietnam’s leaders mirrored their counterparts in Washington by consistently lying to their citizens and by callously sending tens of thousands of their young on suicidal offensives that had little chance of success. Similarly, the filmmakers get beneath the surface enough to reveal who actually fought the war. Just as the overwhelming majority of American soldiers were working class or minorities, the North Vietnamese side was composed almost entirely of peasants and workers. Meanwhile, children of Hanoi’s elite went to the safe environs of Moscow to further their education. Back in the United States, children of the white upper middle class and the privileged found safety in their student and other draft deferments. Military recruiters would hate to have any of their potential enlistees watch this series. Those who sit through all 10 episodes will have a tough time discerning significant differences between the war in Vietnam and the ones in Iraq or Afghanistan. Common themes abound: lies, pointless battles, mindless violence, corruption, stupidity. Unfortunately, most viewers will justifiably feel totally overwhelmed and helpless by the end of this epic film. That’s why it’s important to spotlight the misrepresentations and underestimations of the peace movement. For the success of the anti-Vietnam war movement provides hope and illustrates the power of resistance. Rarely in history have citizens been effective in challenging a war. Other unpopular American conflicts have had their protesters—the Mexican, Civil and Spanish-American Wars, World War I, and more recently the wars in Iraq and Afghanistan. Opposition typically fizzled out soon after troops were sent into action. Not so in the case of Vietnam. No other antiwar cause has developed a movement nearly as massive, endured as long or accomplished as much as the struggle against the Vietnam War. The Vietnam peace movement provides an inspiring example of the power of ordinary citizens willing to stand up to the world’s most powerful government in a time of war. Its story deserves to be told fairly and fully.